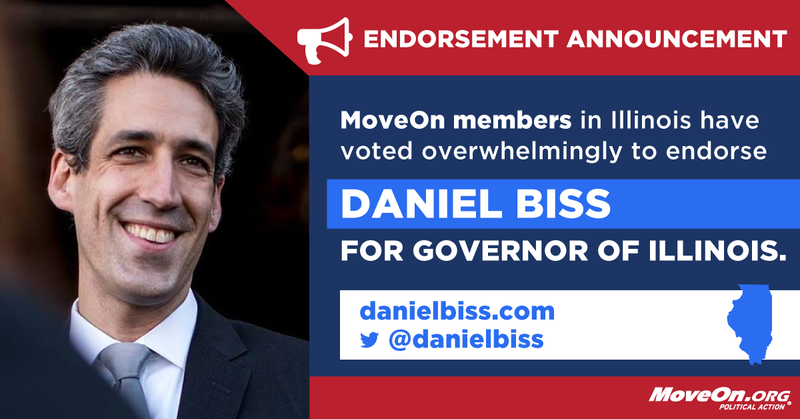 MoveOn members praise Biss’ support for single-payer health care, tuition-free public universities, fixing our broken criminal justice system, and making sure the wealthy pay their share. Best choice to take on Republican Bruce Rauner in November. ILLINOIS — Illinois members of MoveOn.org Political Action have voted overwhelmingly to endorse Daniel Biss in the state’s gubernatorial race, with 66% of votes cast in favor of backing Biss, who is challenging Republican incumbent Bruce Rauner. MoveOn members praised Biss’ people-powered campaign and progressive policy agenda. MoveOn will mobilize its 265,000 members in Illinois to volunteer and vote for Biss. This cycle, MoveOn members have also endorsed seven Senate candidates: progressive Tammy Baldwin (WI) and Sherrod Brown (OH), who are running for reelection in states Trump won; Beto O’Rourke (TX); as well as progressive champions Mazie Hirono (HI), Chris Murphy (CT), Bernie Sanders (VT), and Elizabeth Warren (MA) for reelection. MoveOn members have also endorsed Marie Newman for Congress (IL-3) and Stacey Abrams for Governor (GA).